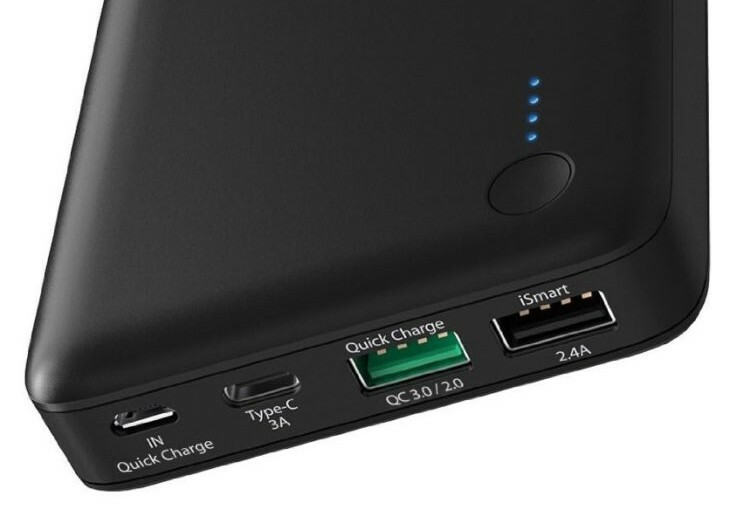 Most modern power banks these days come with three types of ports – Regular USB ports, Fast charging USB ports and Qualcomm QuickCharge ports. Some – like RAVpower 20100 USB-C – have all the three ports! Now, the question arises: If fast and Quickcharge ports are available to rapidly charging your phones, then why should’nt you ALWAYS use them only instead of the regular slow 1A USB ports. Regular USB ports supply 1 A current at about 5 V and charge your smartphones or tablets the slowest. Fast charging ports supply about 2 to 2.4 A power at 5V and charge your phones in about half time than regular ports. Qualcomm QuickCharge ports supply 5 to 12 V power at varying current levels up to 3A and charge your devices in about twice to three-times as fast as regular ports. Such ports also top-up the initial 80% power blazing fast – in about 30 minutes, after which the current & voltage are reduced and charging rate is reduced. The catch in using fast charging ports is that as charging current and voltage increase, the efficiency of the charging process reduces even though the charging speed increases. This means that when you use fast charging ports a lot of the power stored in the power bank gets waste and is not used to charge the devices. As Li-ion or Li-Po batteries used in phones and power banks operate at 3.7 -4.5 Volts, each time voltage is increased to match 5 Volt , power gets wasted during the conversion. Similarly, charging at massive currents, more than what the battery can handle, wastes power during the charging process. This means that if you use fast charging ports, your smartphones will get charged faster but you will be able to get less number of charges than your power bank. On the other hand, if you want to extract the maximum capacity from your power bank, you should charge with the regular – slow and steady 1 A charging port. Charging from regular ports will allow you to stretch your power bank’s capacity to the maximum and get the most possible charges from it. In situations such as camping or hiking, where the most important factor is to extend the battery capacity of the power bank to maximum, the recommended charging method is to use the regular 1A ports only. The smart practice is to charge with the fast charging ports ONLY when you are really in a hurry and need to charge your smartphone or tablet as fast as possible without worrying about further recharges from the power bank. This means that as for as possible avoid charging your smartphones or tablets from the fast charging ports in situations such as long flights or in the wilderness. In such situations, you may mostly not need a quick 30-minute top-up for your device. Hence, the smart way will be to use the device while charging it with the slow and steady 1A regular charging port. this way your power bank capacity will last to ts maximum rated capacity.